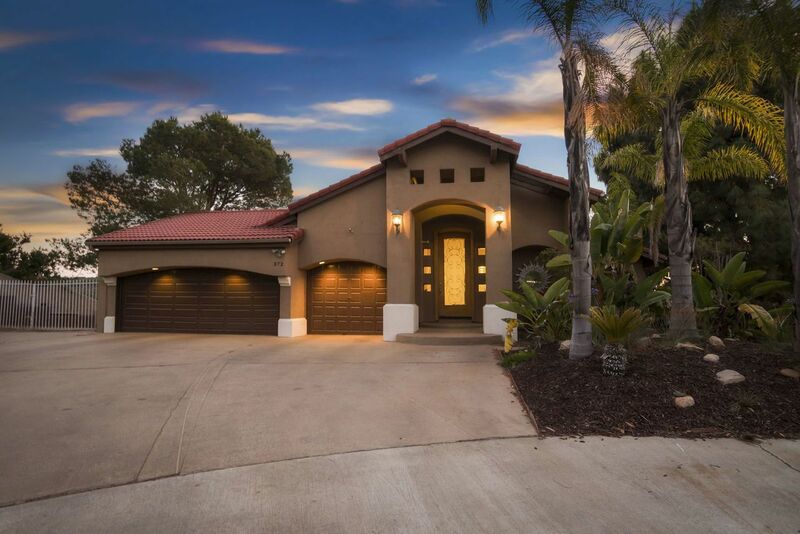 Do not miss this stunning custom built home located high on the hill in the highly desired Rancho Robinhood neighborhood of Bonita. This one of a kind home is ideally situated at the end of a private cul-de-sac, offering cool breezes and stunning panoramic views of the ocean, Point Loma, Coronado, and Downtown. As you open the front door, you will be wowed by the grand entry and soaring vaulted ceilings. You will notice that every attention to detail was paid in the construction of this stunning home, with a focus on capturing ample natural light and creating a spacious layout. The impressive great room features a grand fireplace with towering ceilings and oversized walk around balcony. The chefâ€™s kitchen features custom cabinetry throughout with a large center island, and it is well laid out to take in the stunning views. The large master suite on the main level features ample natural light with access to the large balcony. The en-suite master bath includes a large walk-in closet with custom built-ins, and stunning master bath with marble shower and jetted tub. The dining room currently features a built-in bar, which is well set up for entertaining and the living room functions as the dining area. This could easily be switched back or be kept the same for those that like to entertain. (The spacious floor plan gives multiple options.) The primary/entry level of the home lives like a single story featuring the kitchen, great room, family room, dining and master / 2nd bedroom and powder room. As you walk down to the lower level, you will discover the large game room (optional 5th bedroom), a theater room, laundry room, a full bed/bath that would be perfect for a granny flat/in-law quarters and an indoor saltwater swimming pool. The stunning indoor pool area features large patio doors giving an indoor-outdoorexperience,and also includes a shower to rinse and a sauna. As you walk upstairs, you will locate the 4th bedroom with en-suite bath. The home features room for RV parking and an oversized 3-car garage. This beautiful custom estate is not to be missed, and the features are too long to list. The home includes Boston Acoustics speakers throughout the interior and exterior, dual/zoned A/C system, whole house water softener, and more! The 3 large decks/patios perfectly capture the serene setting of the home and offer a great balance ofindoorand outdoor living. The spacious backyard is a blank pallet for someone to bring in their touches and includes a large fire pit for those relaxing evenings under the stars. This remarkable home is a truly one of a kind and not to be missed!